There is superior biomechanical stability with cervical pedicular fixation (CPF) compared to use of lateral mass screws. , During the last decade, CPF has been used in the treatment of degenerative disorders,  as well as in trauma surgery. , Since 1994, several attempts have been made to enhance the safety and accuracy of CPF. Based on current experimental and clinical studies ,,,, computer-assisted surgery systems are suggested to be the safest procedures for CPF. ,,,, Appealing clinical results were achieved with CPF. , However, in laboratory studies pedicle perforation could not be completely prevented with any technique. ,,,, Some authors have been more critical of this technique(CPF) with used to stereotactic  or computed tomographic (CT) guidance. Many surgical procedures may be performed for cervical spondylotic myelopathy or ossification of the posterior longitudinal ligament, and associated with a high incidence of neurologic morbidity, construct failure, and pseudoarthrosis in lateral mass screw placement. ,, We theorized that laminectomy and stabilization of the cervical spine with CPF would obviate the advantages in osteoporotic cervical spine decompression, prevent the development of kyphotic deformity. The purpose of this study is to evaluate the feasibility and accuracy using of fluoroscopy CPF in a standardized clinical protocol for patients with spinal spondylotic myelopathy treated by laminectomies. The exclusion criteria was transverse foramen stenosis. Preoperative evaluation for stenosis was performed with CT scan in all patients. All the cases were monitored for anterior additional pathologies in the preoperative evaluation by magnetic resonance imaging (MRI). Detailed pedicle length and diameters, and frontal, sagittal, and longitudinal angles of all pedicles were calculated prior to the operations with 3D CT. Posterior transpedicular fixation was applied to all cases utilizing monoplanar imaging using fluoroscopy. Grade I: Screw centered in the pedicle causing only minor plastic deformation of the pedicle cortex at most. Grade IIa: Screw threads or less than one-fourth of the screw cross section penetrating the cortex; no contact of the screw with the spinal cord, nerve root, or vertebral artery. Grade IIb: More than one-fourth of the screw cross section penetrating the cortex but no contact with neurovascular structures. Grade III: Screw position according to grade II, however, in contact with neurovascular structures. A case of a 64-year-old man who underwent right nephrectomy 5 years ago due to renal clear cell carcinoma. He had neck and hand pain. Myelopathic signs were positive Hoffman and Babinski signs. His Nurick Scale was 3. 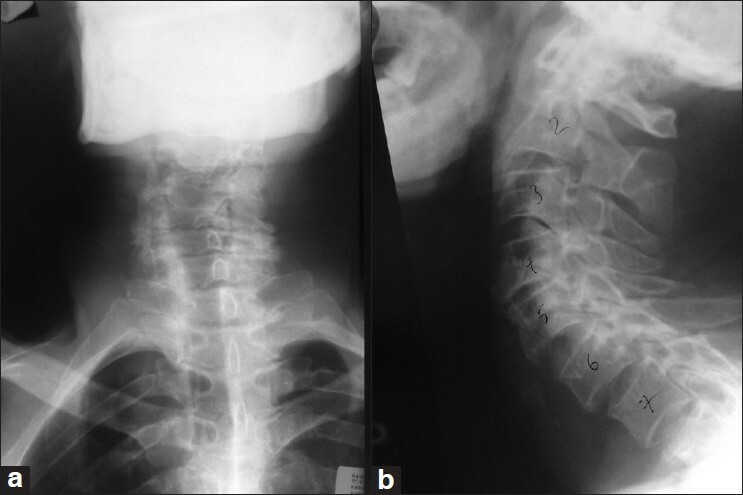 A plain radiography showed mild spondyloathropathic changes [Figure 1]. Both CT and MRI showed marked spinal stenosis due to degenerative spondyloarthropathy [Figure 2] and [Figure 3]. The portion projecting into the posterior decompression was performed in the prone position, and fusion technique with the graft obtained from the iliac wing was performed after C3-C6 [Figure 4]. 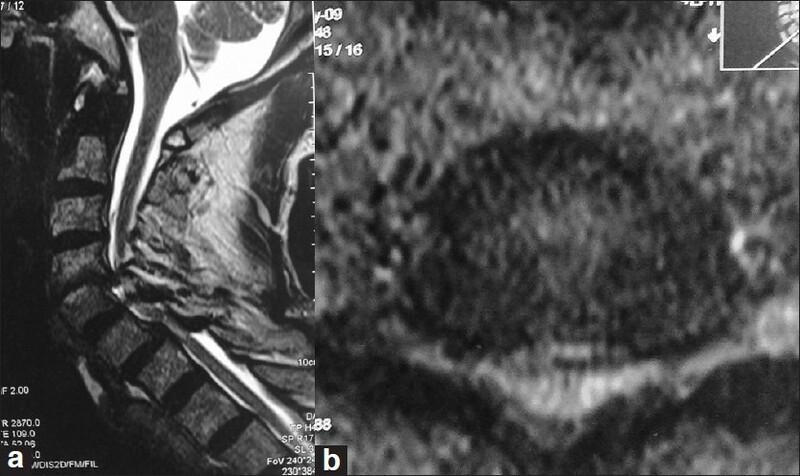 Postoperative CT showed correct position transpedicular insertion in the cervical pedicle spine [Figure 5]. The patient's VAS score was 3, and Nurick scale was 1 at the 20-month follow-up. The head is fixed in natural prone position. Paravertebral muscles are stripped with a classical midline incision. Only the facet joint surfaces to be operated are decorticated to thoroughly clean up the capsule. Other facet capsules are maintained. Laminectomy was performed. The dominant vertebral arteries of all patients were detected at the preoperative stage, and screw fixation was applied at the nondominant side of the same level. Following nonproblematic insertion of the first screw, in other words after seeing that there is no rupture, the screw of the dominant side was placed. This process is applied before the screw is placed, in the cases to go through laminectomy. This way, the position of the screw inside the spinal canal can be observed. The entry point of the pedicles between C3 and C7 is 2 mm lateral to the superior articular process midpoint. In the sagittal plane, it is angled nearly 10° at C3, whereas it is kept neutral or angled 2° at C7. The medial orientation angle of the pedicle, on the other hand, is 45° on average. After biplanar control of the position of the deformity and the screws with scopy image, bone grafts obtained from the iliac wing are placed at the decorticated areas. As a result of 70 pedicles applications on a total of 10 patients, the pedicle screws were at their correct positions 100% of the time. All the patients were mobilized at postoperative day 1. The screws were of length 31.4 mm for C3-C7, and overall thickness was measured to be 3.0 mm. No patients experienced neurovascular injury as a result of pedicle screw placement. Two patients had screw malposition, which did not require reoperation due to minor breaking. Postoperative CT scanning showed no compromise of the foramen transversarium. Bony fusion was observed in all patients. At follow-up, 9/10 (90%) patients had improved in their Nurick grades. The average surgical duration was 105 (90-155) min. The average amount of hemorrhage was 140 cc. None of the patients required transfusion. None of the cases suffered hemorrhage due to neurovascular damage. The cases were followed-up for an average of 35.7 months (30-37 months). Preoperatively, we obtained imaging studies in all patients by using plain cervical roentgenography, biplanar CT scanning through bone windows, and MRI. USG was preoperatively performed in all patients to determine the side of the dominant vertebral artery. Bilateral oblique plain X-ray films were routinely obtained to evaluate the condition and size of pedicles of each vertebra. The local kyphosis was determined as the kyphosis angle. The placement of pedicle screws were inspected on postoperative CT scans (in general, 2 mm slices) within the first day of surgery, at later follow-up visits, stability was assessed on flexion-extension radiographs and standard lateral and posterior-anterior views. The follow-up imaging studies were carefully interpreted to identify screw and rod loosening or breakage. We demonstrated that fusion was achieved in all patients. Preoperatively and postoperatively, kyphotic deformity at the affected segment, which averaged to 23° (16-43 °), was revealed in 9 patients, which was corrected to 1.2° lordosis after surgery and 0.8° lordosis at the final follow-up examination. Postoperative CT scan was performed in all patients. Postoperative MRI was not revealed in any patient. All the cases were mobilized at postoperative day 1. Collar was used for neck support for an average of 4 weeks. Controls were performed by X-ray imaging as a standard application, and tomography for postoperative pedicle-screw harmony. The cases were followed-up for an average of 35.7 months (30-37 months). The various posterior fixation techniques, spinous process wiring, triple-wire technique, and sublaminar wiring require use of the lamina as the stabilizing anchor. These techniques allow simultaneous posterior decompression with fixation and stabilization in patients who have undergone previous laminectomy in the cervical spine  However, postoperative rigid external support using a halo vest was required for many patients. Modifications of cervical facet fusion, which is supplemented by rods as longitudinal connectors, may provide some stabilizing effect  but stability is not sufficient enough to preclude the need for postoperative external support. Biomechanical studies have revealed that posterior fixation devices have an advantage over anterior devices for the fixation of posterior instability after laminectomy , Anterior surgical approaches did not provide sufficient correction of postlaminectomy kyphosis in the cervical spine. Kotani et al., have shown that of all the fixation devices only the pedicle screw system provide adequate stability in a three-column injury model. Joner et al. have provided evidence of greater resistance of pullout of pedicle screws compared with lateral mass screws. In addition, cervical lordosis reconstructed with pedicle screw fixation systems may provide adequate stability, because lordotic spinal alignment allows the gravity axis to pass through the posterior structures that are reconstructed by rigid instrumentation. Therefore, CPF may obviate the need for anterior surgery in some patients, such as those with metastatic vertebral tumor who might otherwise require a combined surgery (anterior-posterior). Some of the reports on lateral mass screw procedures have described several cases of screw loosening that resulted in pseudoarthrosis and loss of kyphosis correction between 2006 and 2009. ,, But, our findings suggest that screws inserted into the cervical pedicle provide a more rigid anchor for internal fixation than lateral mass screws, as suggested by in vitro biomechanical studies. We didn't observe any complications, such as pseudoarthrosis or loosening of the screw in our cases who had been operated with CPF. This system is particularly useful in reduction and stabilization of the degenerative cervical spine. Strong fixation to the vertebra by pedicle screw enables application of distraction force to the cervical spinal segment. We did not observe any patients in whom neurolog status deteriorated postoperatively. Therefore, CPF system can be safely used to reduce spondylotic changes in cervical spine in one-stage surgery, precluding the need for anterior decompression of the spinal canal. Our results after this technique of CPS insertion with an obvious cortical breach incidence of 13.5 %, including a critical breaking rate of 0.9%, are somewhat similar to those of the large series (116 cervical pedicle) of Rath et al. We report a 0.9% incidence of vertebral foramen penetration (100%) in a clinical series of 105 pedicles. We would think of using the intraoperative image-guided or stereotactic guidance, which may improve accuracy and significantly reduce the risk of neurovascular injury, especially in the cervical pedicle. However, the current technology is at its limits and we are not able to use these techniques. A lot of clinical series have been published in the literature about CPF, but no vascular complications of CPF have been reported , However, including our series, cases with massive encroachment of the transverse foramen by screw misplacement have been described. Abumi et al. included 9 cases with lateral screw perforation in their study, all without vertebral artery (VA) injury  The VA does not occupy the entire transverse foramen, and the risk of injury may not be as high as most authors fear, although devastating sequelae may result from an acute lesion to this vessel  Careful drilling and tapping as well as cautious screw insertion seem only to displace the VA without damaging or obliterating it. Within the cervical spinal foramen, the nerve roots are located in the inferior half of the disc. We did not detect any cranial or caudal violations of the pedicle. This can be explained by the fact that cervical pedicles have an oval shape with a significantly greater height than width at all levels  Peroperational neural injury or damage is a rather rare complication of CPF placement. The incidence of nerve injury is reported only as 1%. ,,,, With this technique by experienced surgeons, the incidence of neural injury was 0% in our series. The incidence of nerve injury of CPF can be reduced with laminectomies. Use of the CPF provides a very strong three-column stabilization but also carries vascular injury without nerve damage. Laminectomies technique may reduce the risk of malposition due to visualization of spinal canal. CPF can be performed in a one-stage posterior procedure. This technique yielded good fusion rate without complications and can be considered as a good alternative compared to other techniques. 1. Jones EL, Heller JG, Silcox DH, Hutton WC. Cervical pedicle screws versus lateral mass screws. Anatomic feasibility and biomechanical comparison. Spine 1997;1;22:977-82. 2. Kotani Y, Cunningham BW, Abumi K, McAfee PC. Biomechanical analysis of cervical stabilization systems. An assessment of transpedicular screw fixation in the cervical spine. Spine 1994;15;19:2529-39. 4. Abumi K, Kaneda K. Pedicle screw fixation for nontraumatic lesions of the cervical spine. Spine 1997;22:1853-63. 5. 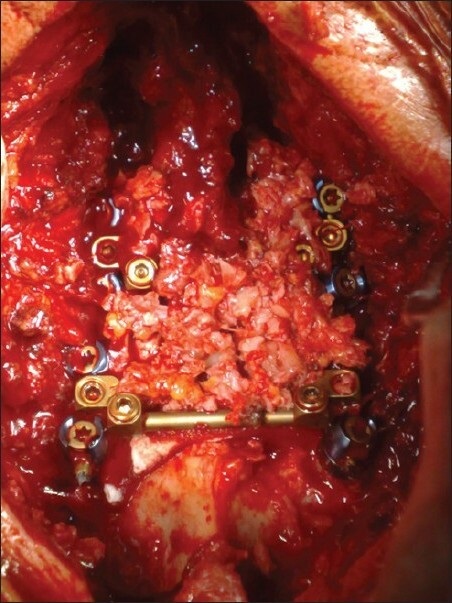 Abumi K, Shono Y, Ito M, Taneichi H, Kotani Y, Kaneda K. Complications of pedicle screw fixation in reconstructive surgery of the cervical spine. Spine 2000;25:962-9. 6. Bale RJ, Hoser C, Rosenberger R, Rieger M, Benedetto KP, Fink C. Osteochondral lesions of the talus: computer-assisted retrograde drilling-feasibility and accuracy in initial experiences. Radiology 2001;218:278-82. 7. Holly LT, Foley KT. Percutaneous placement of posterior cervical screws using three-dimensional fluoroscopy. Spine 2006;31:536-40. 8. Ludwig SC, Kramer DL, Balderston RA, Vaccaro AR, Foley KF, Albert TJ. Placement of pedicle screws in the human cadaveric cervical spine: Comparative accuracy of three techniques. Spine 2000;25:1655-67. 9. Neo M, Sakamoto T, Fujibayashi S, Nakamura T. The clinical risk of vertebral artery injury from cervical pedicle screws inserted in degenerative vertebrae. Spine 2005;30:2800-5. 10. Rampersaud YR, Simon DA, Foley KT. Accuracy requirements for image-guided spinal pedicle screw placement. Spine 2001;26:352-9. 11. Reichle E, Sellenschloh K, Morlock M, Eggers C Placement of pedicle screws using different navigation systems. A laboratory trial with 12 spinal preparations. Orthopade 2002;31:368-71. 12. Rezcallah AT, Xu R, Ebraheim NA, Jackson T. Axial computed tomography of the pedicle in the lower cervical spine. Am J Orthop 2001;30:59-61. 13. Sakamoto T, Neo M, Nakamura T. Transpedicular screw placement evaluated by axial computed tomography of the cervical pedicle. Spine 2004;29:2510-4. 14. Yusof MI, Ming LK, Abdullah MS, Yusof AH. Computerized tomographic measurement of the cervical pedicles diameter in a Malaysian population and the feasibility for transpedicular fixation. Spine 2006;31:E221-4. 15. Richter M, Cakir B, Schmidt R. Cervical pedicle screws: Conventional versus computer-assisted placement of cannulated screws. Spine 2005;30:2280-7. 16. Reinhold M, Magerl F, Rieger M, Blauth M. Cervical pedicle screw placement: Feasibility and accuracy of two new insertion techniques based on morphometric data. Eur Spine J 2007;16:47-56. 17. Sakamoto T, Neo M, Nakamura T. Transpedicular screw placement evaluated by axial computed tomography of the cervical pedicle. Spine 2004;29:2510-4. 18. Reinhold M, Bach C, Audigé L, Bale R, Attal R, Blauth M, et al. Comparison of two novel fluoroscopy-based stereotactic methods for cervical pedicle screw placement and review of the literature. Eur Spine J 2008;7:564-75. 19. Rath SA, Moszko S, Schäffner PM, Cantone G, Braun V, Richter HP, et al. Accuracy of pedicle screw insertion in the cervical spine for internal fixation using frameless stereotactic guidance. J Neurosurg Spine 2008;8:237-45. 20. Callahan RA. Johnson RM, Margolis RN. Cervical facet fusion for control of instability following laminectomy. J Bone Joint Surg Am 1977;59:991-1002. 21. Garfin SR, Moore MR. Marshall LF. A modified technique for cervical facet fusions. Clin Orthop Relat Res 1988;230:149-53. 22. Capen DA, Garland DE, Waters RL. Surgical stabilization of the cervical spine. A comparative analysis of anterior and posterior spine fusions. Clin Orthop Relat Res. 1985 Jun;(196):229-37. 23. Anderson PA, Henley MB, Grady MS. Posterior cervical arthrodesis with AO reconstruction plates and bone graft. Spine 1991:16(3 Suppl):S72-9. 24. Fehlings MG, Cooper PR, Errico TJ. 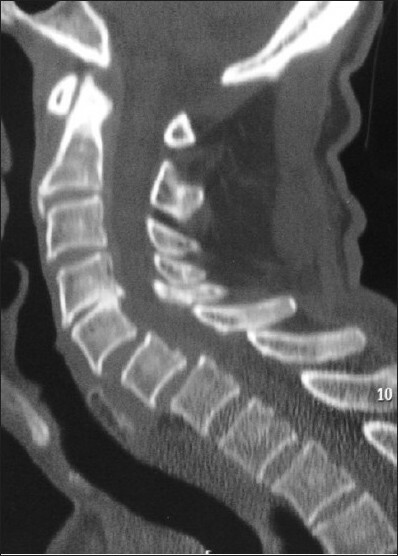 Posterior plates in the management of cervical instability: Long-term results in 44 patients. J Neurosurg 1994;81:341-9. 25. Richter M, Amiot L, Neller S, Kluger P. Computer-assisted surgery in posterior instrumentation of the cervical spine: An in-vitro feasibility study. Eur Spine J 2000;9 Suppl 1:65-70. 26. Abumi K, Kaneda K, Shono Y, Fujiya M. One stage posterior decompression and reconstruction of the cervical spine by using pedicle screw fixation systems. J Neurosurg 1999;90(1 Suppl):19-26. 27. McCullen GM, Garfin SR. Spine update: Cervical spine internal fixation using screw and screw-plate constructs. Spine 2000;25:643-52. 28. Heller JG, Silcox DH 3 rd , Sutterlin CE 3 rd .Complications of posterior cervical plating. Spine 1995;15;20:2442-8. 29. Karaikovic EE, Yingsakmongkol W, Gaines RW Jr. Accuracy of cervical pedicle screw placement using the funnel technique. Spine 2001;26:2456-62. 30. Kothe R, Ruther W, Schneider E, Linke B. Biomechanical analysis of transpedicular screw fixation in the subaxial cervical spine. Spine 2004;29:1869-75. 31. Ugur HC, Attar A, Uz A, Tekdemir I, Egemen N, Caglar S, et al. Surgical anatomic evaluation of the cervical pedicle and adjacent neural structures. Neurosurgery 2000;47:1162-8.